Mozart uses a veritable smorgasbord of musical styles in Die Zauberflöte. He wasn’t breaking the mould in doing so – as a Singspiel (‘sung play’, a form of vernacular opera with spoken dialogue popular in Mozart’s time) Die Zauberflöte is not unusual in mashing together lots of different types of music. What is rare is the extraordinary skill with which Mozart makes all this music seem part of a coherent whole, and the way he uses the characteristics of each different style to tell us something new about the characters. We look at a handful of the types of music Mozart draws on in the opera. Papageno’s first aria is an introduction both to this bumbling birdman and to one of the opera’s many dichotomies – his cheerful arrival provides a bathetic contrast to the heroic Tamino. Papageno is the mensch of the opera; though he ultimately falls short of the enlightenment attained by the noble Tamino and Pamina, he's in many ways the opera’s heart. He’s one of the people, the audience’s representative on stage – and so he sings something like a folksong, with simple short phrases and repeated verses. We learn of his happy daily life and also of his longing for companionship – he wants a wife, to whom he could give as much sugar and as many cuddles as she likes. This majestic aria at the start of Act II is Sarastro’s first extended solo. Mozart needs to achieve an about-turn with Sarastro; until the very end of Act I he was the opera’s absent villain, a shadowy figure fiercely reviled by the Queen of the Night. When we finally meet him, we, like Pamina and Tamino, must not only understand but believe in his goodness. Mozart achieves this with an aria that looks back to the opera seria of Gluck and which, despite its brevity, evokes the grandeur and nobility of Sarastro’s character. With an authoritative bass voice Sarastro sings in long measured lines that convey his serenity and majesty. The echoing chorus softly confirms the respect his people hold for him. The Queen of the Night is angry. She’s not the kind to keep it to herself; hers is a spitting rage, to be declared with all the haughty fury a queen can muster. What better musical tool could she use than coloratura? In her second aria she rains shower after shower of arrow-like notes down on her poor daughter Pamina in tyrannizing anger. The stratospherically high vocal line illustrates her steely cruelty, as she commands her daughter to kill Sarastro or be cast off entirely. ‘Der Hölle Rache’ has become probably the most famous aria in the coloratura soprano repertory, with audiences across the centuries drawn ineluctably to its fiercely difficult and fiery brilliance. Tamino must undergo trials to enter Sarastro’s brotherhood. But it is Pamina who truly suffers in this opera. She has been captured by Sarastro, assaulted by Monostatos, tormented by her mother. And now Tamino will not speak to her – unbeknownst to Pamina, he has been commanded to undergo a Trial of Silence. Mozart gives her an aria of haunting, anguished beauty – an expression of all the torment she has suffered, with the loss of Tamino’s love as her greatest pain. Her delicately ornamented line shines out against a bare accompaniment, a symbol of her desolation. Mozart takes the voice higher and higher as Pamina’s anguish increases before she ends in hushed resolve to take her life. These are just a few of Die Zauberflöte’s highlights – which is your favourite? Die Zauberflöte runs 23 February–11 March 2015. A limited number of tickets are available. The production is given with generous philanthropic support from The Jean Sainsbury Royal Opera House Fund and Martin and Jane Houston. My favorite will always be Diana Damrau as Die Königin. That performance was what made me give opera another chance. I was stunned, and absolutely enchanted. For me, there will never be another Queen. Never! 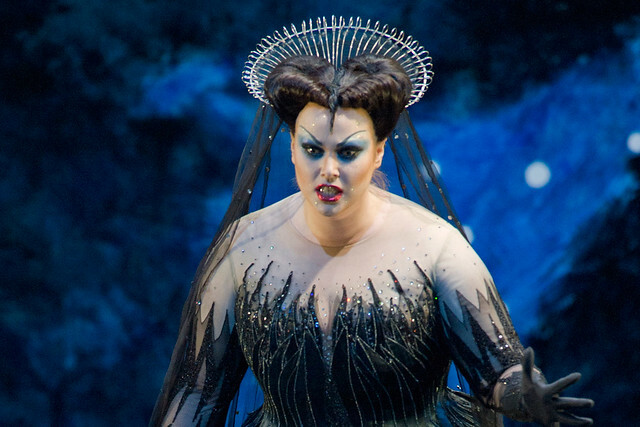 Who is the soprano who sings the Queen of the Night?